Codenamed Turnstile, Burlington Bunker was one of the most secret locations of the British Government in the 1960s. This unique series of photographs was taken by landscape photographer, Jason Orton. We are delighted to have his permission to use them on our website. All photographs are © Jason Orton. Below, you can read more about Jason's visit beneath Box Hill and of his other work. Built in the 1950s as a replica of Whitehall, Burlington Bunker, codename Turnstile, was intended to be the government's very own emergency hideaway in the event of nuclear war. My first visit to this immense subterranean cold war city, located beneath Box Hill, was in 2002 with the writer Peter Hennessy. 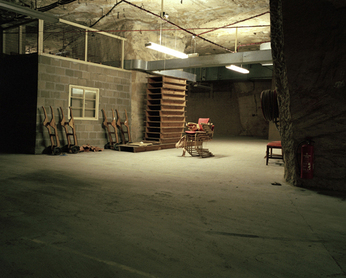 I had been commissioned to produce a series of photographs for his book Secret State, and at the time, we agreed that when the bunker was declassified we would return, which we eventually did in 2006. My photography often explores those traces within a landscape that hint at something that has happened, or might happen in the future. I am concerned with evidence and remains of human occupation within a landscape. Turnstile was never occupied, but wandering these labyrinthine tunnels and bunkers it is possible to imagine what life would have been like underground in the aftermath of a nuclear attack. Wherever you look in Turnstile, there are a series of poignant reminders of what this place was intended for. A faded picture on the wall depicts an idyllic pastoral landscape, reminding people of a world they have left behind. Words etched on a wall read: stuck here for eternity. Then you find the more obvious things that would have been necessary for the chosen few: industrial sized kitchens, a hospital, a telephone exchange, a BBC studio where the prime minister would address the nation – assuming he still had a nation to address. The complex had its own electricity generator, water purifying system, and heavy duty air ducts that could be sealed against gas and radiation. However, the underground city has now been declassified and the site put up for sale. Its future – which seems to be part of a wider initiative called the Corsham Development Project – is as yet unknown. Several uses for the tunnels have already been considered. These include a massive data store for city firms, and – because of its almost perfect temperature – a vast wine cellar, possibly the largest in Europe. The Ministry of Defence, which retains ownership of the underground site, has ruled out any suggestion of using it to store nuclear waste, or of providing open public access. But what happens to the contents of this underground city? Left as it is, Turnstile remains a powerful reminder of a time when there was a genuine fear of a nuclear war. However, creating a cold war time capsule does not appear to be an option. Most of what remains will be removed; where it goes, nobody seems prepared to say.